This weekend I've been going through old files, correspondence, boxes, etc. doing a major fall housecleaning. In the process I've uncovered a lot of wonderful (and not so fond) memories. Over the next few days I'll be sharing some of the old pictures. Many of them will give you a good laugh. Most of them pertain to our involvement in various sports ministries. This picture was taken of my father on his birthday on May 5th, 1992. 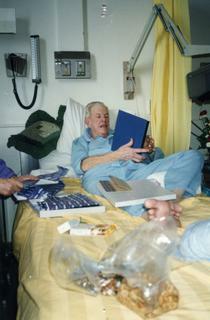 Dad was in Kingston General Hospital, battling lung cancer. No, he never smoked a day in his life! That morning I took a book filled with tributes for dad. I had gathered them from civic leaders, missionary statesmen, employees, friends in ministry, family and others. When dad opened the box and began to read, he was overcome with tears. Looking back, it was likely the most meaningful thing I have ever done. The Lord put this idea on my heart and I obeyed and began working on the project immediately. About 70 people responded. Dad went to be with the Lord on May 21st, 1992. I'll never regret putting that tribute together. I hate to think how I'd feel if I hadn't obeyed the Spirit's voice.